Synopsis: A high-profile terrorism case unexpectedly binds together two ex-lovers on the defense team – testing the limits of their loyalties and placing their lives in jeopardy. Review: I think we’ve been long overdue for a paranoid thriller with conspiracies at every corner and the threat of mortal danger with each new secret discovered so I was looking forward to the twisty feast that Closed Circuit purported to offer. Sadly, though the appetizer of the film was filling if lacking spice the main course was a flavorless Jell-O mold of stale red-herrings. A bombing in a populous square in London leaves many dead and is described as the worst terrorist attack on record. A suspect is arrested and, due to issues of national security, given two lawyers for his defense. One will try the case in open court while the other is appointed as a Special Advocate, privy to private, classified information that the other lawyer can’t hear and will present in a closed session. It’s a strange situation and unlike any we’ve seen in most courtroom thrillers so the set-up is appealing…at the start. Taking elements from any number of government conspiracy thrillers from the 70’s and 80’s, the film starts out sharp with a nicely tense opening sequence of the closed circuit cameras that pick up the moments leading up to the bombing. When the original lawyer assigned to the case takes his own life (a scenario no one seems to bat an eye at in a case we’re constantly reminded is the most important in British history), the job goes to Martin Rose (Eric Bana, Star Trek, Lone Survivor) who soon finds out that the Special Advocate assigned to the case is his former mistress Claudia (Rebecca Hall, Iron Man 3, The Awakening). Now their past relationship should mean that one of them has to recuse themselves but, no, where would that leave us? The law states that the two are to have no contact so the audience is left to wonder two things. The first is why Martin and Claudia ever got together in the first place. There’s an obvious lack of chemistry between the actors and it’s tough to pinpoint who is more at fault, Bana’s cocky puffshirt of an attorney or Hall’s chilly take on her character. The second thing is how long it will be before Martin and Claudia break the rules and start talking about the case with each other. As the movie follows Martin and Claudia conducting their own investigations into the bombing, a whole slew of extra characters are introduced and nearly all are written in solely to give information that moves the plot along. Julia Stiles’ (Silver Linings Playbook, Girl Most Likely) miniscule role is given such short shrift that her exit from the film might very well be missed if you look away. Jim Broadbent (Cloud Atlas), Riz Ahmed (The Reluctant Fundamentalist), and Ciarán Hinds (The Woman in Black, John Carter) get their jobs done efficiently, even if they are merely obviously placed roadblocks to Martin and Claudia getting at the truth of it all. If the film is worth seeing it’s for a scene that I can’t even talk about because it would give the one interesting twist the movie has up its sleeve. I’ll just say that it involves Hall’s character cross-examining a witness that audiences won’t see coming (well, if you’ve seen the trailer you may…so take my advice and don’t watch it). That this scene crackles is thanks to the actor playing opposite Hall and it gives way nicely to several more scenery chewing moments. Unfortunately, this scene a little over halfway through the movie can’t snap the film back onto the promising track it started off on. It winds up blowing totally off course as it struggles to find an ending that is suitable and winds up settling for a denouement that’s not very exciting or satisfying. 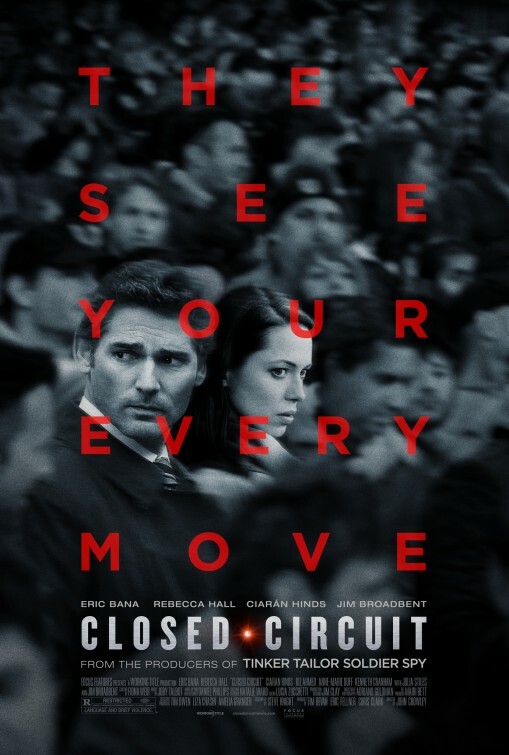 Arriving at the tail end of the summer movie season, Closed Circuit seems out of place for this time of year and with so many other strong films arriving in the last few weeks, this isn’t one I’d make a serious effort to see. A fine rental for a rainy day but not worth the trip to the theater. Synopsis: Martin and Claudia are lawyers — and ex-lovers — who find themselves put at risk after they join the defense team for an international terrorist’s trial. Thoughts: Though it does remind me of something moviegoers would have been treated to in the early 90’s, this UK thriller boasts a nicely low-key cast and a premise that may have some mileage in it. I’ve never been totally won over by either Rebecca Hall (The Awakening) or Eric Bana (Star Trek) but this movie intrigues me. I love a nice courtroom thriller and this seems to fit squarely into a John Grisham-y rhythm that could be worth investigating when it goes before the late summer film fan jury. Synopsis: After a stint in a mental institution, former teacher Pat Solitano moves back in with his parents and tries to reconcile with his ex-wife. Things get more challenging when Pat meets Tiffany, a mysterious girl with problems of her own. Review: Quick! What’s the best thing about going to the movies? The answers to this question vary from person to person as we all have our own reasons for seeing (or not seeing) movies. Some go for the escapism, some go for the stars, and others go for solitude. As I get older and amass a large amount of titles under my “Seen” belt I’ve found that it’s when a movie genuinely surprises me that I feel the most maximum reward. 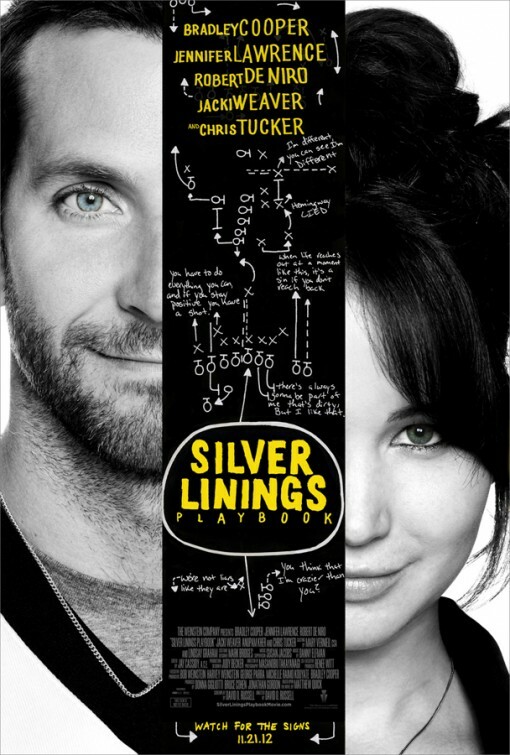 What ultimately makes Silver Linings Playbook so excellent is the way it bucks your typical movie framework for something wholly unique, original, moving, and quite entertaining. Adapted from the novel of the same name by Matthew Quick, here is a film that reveals its heart slowly through scenes of clashing personalities, unspoken hurts, and newfound pain. The characters in the film are pretty flawed but not unredeemable in the eyes of the filmmakers or the viewers. We want to like the man (Cooper) who gets bailed out early from a court mandated stay in a mental institution. And we want to like his parents (Weaver and DeNiro) who bring him home while he recovers. And we really, really want to like the girl (Lawrence) that comes into the life of Cooper’s character and shows herself to be both what he needs and what he fears. Rightfully, Cooper eschews his pretty boy image and instead produces a character that is obviously severely troubled and probably shouldn’t be in the general population. Suffering a break from sanity related to his adulterous wife and their already unhealthy relationship, he emerges from the institution still wearing the scars of that experience. Cooper throws himself into the role and lets us into the mind of Pat by showing in his controlled physicality all that is going on inside him. Obsessed with a reunion with his wife, he blasts his way through his friends and family in the pursuit of wholeness. Into his life comes another broken soul in the form of young widow Tiffany played to perfection by Lawrence. Though originally cast with Anne Hathaway, I can’t imagine Hathaway bringing the same quality that Lawrence does to the multi-layered role. Lawrence started off 2012 with a towering performance in the blockbuster The Hunger Games and has ended it with an award-worthy leading role that might just break your heart. 2012 isn’t quite over yet but Lawrence may have given the performance of the year. More good news in the acting department comes from DeNiro who is doing his best work in years. Strangely attracted to random roles (Being Flynn, Red Lights), he seems to have landed on a real winner here with a part that was changed from the book and tailored to DeNiro’s strengths. DeNiro reminds us why he’s one of the great actors the silver screen has ever seen when he opens up to his son about regrets and disappointment. At the screening I attended author Quick was present and he let us know that DeNiro and Cooper had a father-son bond going into the film and it’s clear to see a high level of respect between the two men in a few blazingly powerful scenes of honesty. Honest is an adjective I’d use to describe the film because it doesn’t go for the easy out or simple explanation. It presents a viewpoint in the lives of a fractured family as they pick up the pieces and see if they can fit together again. Though Cooper, Lawrence, and DeNiro are standouts…there’s nice work from Weaver, Tucker, Stiles, Whigham, and Kher. Only Ortiz strikes a sour note…but that’s mostly due to his role being given a bit too much weight that doesn’t feel justly earned. It’s hard to really describe the film in great detail without uncovering some of the surprises it has in store for you along the way. It’s terrifically funny but colored with a deeply felt melancholy that could only work in the right hands. Thankfully, the right hands are all over the film in its diverse score by Danny Elfman, an inspired soundtrack of spot-on song titles, clever and constantly in motion cinematography by Masanobu Takayanagi, and the strong script by Russell who has a great ear for believable dialogue. Russell’s last film The Fighter spelled Oscar gold for Christian Bale and Melissa Leo and it’s not hard to see award potential in this film as well. Expect this to be an Oscar favorite (Picture, Director, Actor, Actress, Supporting Actor) when nominations are announced. Though it’s mid-November and more award-targeted films are waiting in the wings, I’d say that Lawrence is looking primed to nab a Best Actress Oscar for her work here.